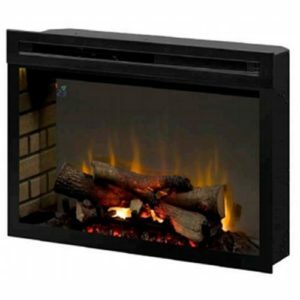 Are you looking for a realistic electric fireplace that will look great in your home? In this 10-minute buying guide, I’ll review the most realistic electric fireplaces you can buy online. They all do a great job of simulating the look of burning logs and flames. Several of them also produce heat or crackling sound effects so that it feels like you have an actual fireplace in your home. For more electric fireplace recommendations, see our other top log units or read our reviews of the best inserts according to verified owners. It’s pricier than most other fireplace inserts, but the Opti-Myst Pro boasts super-realistic flame effects that other inserts cannot match. Your guests will think you have a real wood-burning fireplace in your living room. The insert uses ultrasonic technology to create this hyper-realistic effect. Before you use it, you have to fill it with water. A rapidly vibrating mechanism in the fireplace then breaks up the water into numerous tiny bits which rise upwards. The mist reflects LED light, creating the appearance of rising flames. It also creates a smoke-like effect to the fireplace. A full tank lasts between 14-17 hours of continuous use. So if you turn on the flames for a few hours every evening, it can last several days. It’s super easy to refill the tank, too. Just make sure you use distilled water or filtered tap water for best results. The logs and embers are just as realistic. They are molded from a real log and embedded with LED lights to create a realistic glowing effect. But the Opti-Myst Pro is not just for show. It can also be used to heat up a room of up to 400 square feet. An integrated fan distributes hot air across the room. Use the included remote control to operate the thermostat. You can also turn the heat on or off separately from the flame effects. The remote also has a button for changing the intensity of the flame and smoke effects. Unfortunately, there is no auto-off timer which would help save energy when you fall asleep or forget to turn off the fireplace. Note that the Opti-Myst Pro is designed for permanent hard-wired installation. Find a certified electrician to install it for you. You can install it in your current fireplace or recessed into a cabinet. You may need to get a pro to retrofit your existing space to fit the fireplace insert. If you are looking for a fireplace insert with more settings and options, this 25” electric firebox by Dimplex is the best choice. The flames and logs look very realistic. The logs are molded from real charred firewood to create the most realistic glowing effect. Dimplex calls them RealogsTM. The flames are produced using creative lighting effects. Unlike most fireplace inserts where you can only change flame intensity and brightness, the Dimplex Multi-Fire insert lets you choose from a wide array of theme options using the included remote control. There are several preset options where you can set the flame theme to red, blue, purple or blue. There is also a setting where the flame theme color changes after every few seconds and another one where multiple colors are shown at the same time. You can also set your own custom theme by changing the intensity of the three primary colors: red, green and blue (RGB). Simply increase or decrease the intensity of each shade individually to create whichever theme you want. Each color has 25 intensity options. Using all these settings and options, you can create many different themes to suit your mood, home décor or season. No other electric fireplace offers such versatility. And the options don’t end there. This insert can also be used as a powerful room heater. At max power, it can heat a space of up to 1000 square feet. There is a Heat Boost Mode which delivers max heat output to warm up a cold room quickly. You can set how long this mode lasts (max 20 minutes). When the insert is not in a Heat Boost Mode, it operates using Dimplex’s ComfortSaver technology. It will automatically regulate fan speed and heat wattage depending on how hot the room is. So once the room gets to the set temperature, it operates in a low-intensity mode to save energy. But you can also force it to operate continuously in a low-power mode by pressing the Eco button. You can control the heat independently from the flame effects, meaning you can enjoy this fireplace insert all year round. One other unique feature I like is the wave-detection sensor. Dimplex calls it the gWave technology. Instead of constantly pressing buttons on the remote control, you can control some settings simply by waving at the insert. There is also a timer which automatically switches off the fireplace after a set amount of time. This saves energy in case you fall asleep or forget to turn off the fireplace. If you are buying an electric fireplace mainly for the aesthetics and you don’t need the heat, I highly recommend the Opti-V Solo fireplace insert by Dimplex. It is a beautifully crafted fireplace designed to capture the charm and beauty of traditional fireplaces. 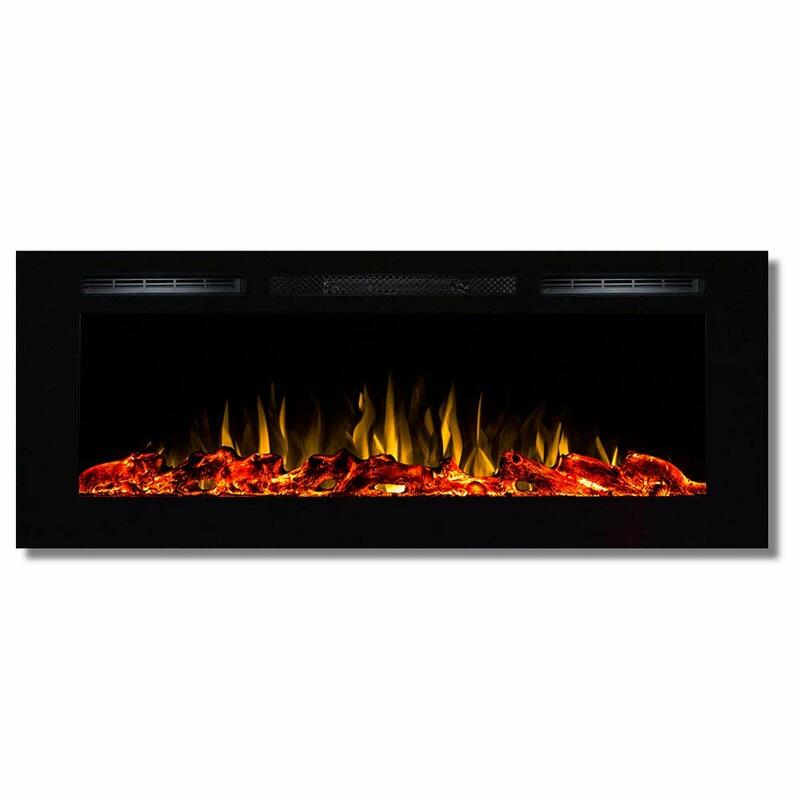 Combined with the stunning flame effects and crackling wood-burning sounds, it is a great addition to any home. The elongated design with a jet black trim blends in perfectly in both modern and traditional style homes. The Opti-V doesn’t have an integrated heater. It’s simply meant for aesthetics. To create a realistic look, they use a log set embedded with LED lights. This gives the logs an ultra-realistic glowing effect. Smaller glowing embers mixed in with larger logs make the fireplace feel more real. The flames are also created using LED lights. Special 3D lighting effects create the appearance of real flames. To complete the fireplace effect this insert produces crackling sounds that simulate the sound of burning wood. The remote control is surprisingly minimalist. It only has a power button and volume control buttons. All other settings can only be accessed from the buttons on the insert itself, which I think is inconvenient since you have to keep getting up to change a setting. Settings available on the insert include sound effects volume control and screen brightness. There is no timer option, but it’s not necessary since this insert has no heat and uses very little power. Even if you leave it on 24/7, it won’t cost you much in terms of power. But I wish Dimplex had added a few other flame effects and colors especially considering that this insert is primarily for decoration. Note that you can install this insert in an existing fireplace or get a pro to recess it in the wall or in a cabinet. 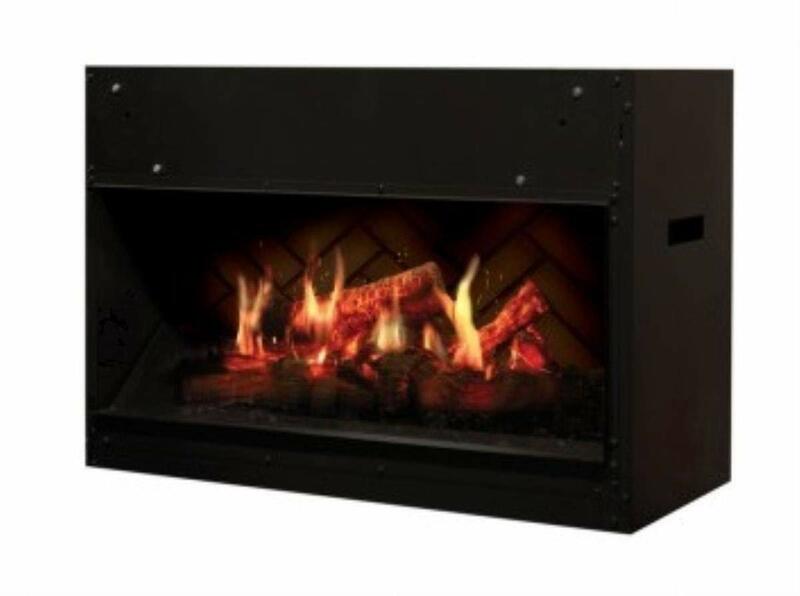 The firebox dimensions are 13.5 D x 17.8 H x 30 W inches. Electric fireplace inserts with supplemental heat are common. But Dimplex is the first company to integrate an air purifier into an electric fireplace. 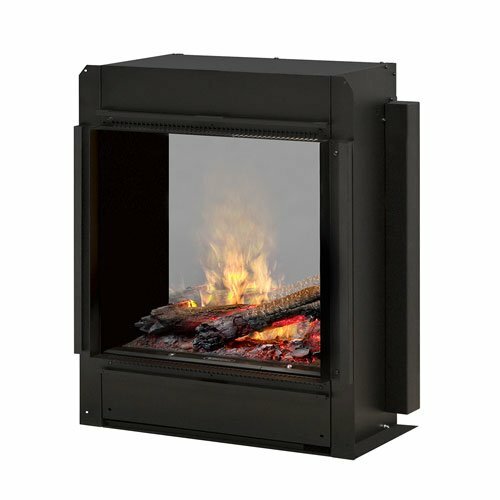 The DF3015 Self-trimming electric fireplace not only warms up the room, but it can also filter allergens and particulates from the indoor air. The fireplace itself looks very realistic with glowing logs and flickering flames giving the appearance of a real wood-burning fireplace. The logs use inner LED lights to create a glowing effect. They are actually molded from real wood logs to provide a more realistic look. The flames are also created using LED lighting. There is a button on the remote for controlling how aggressive they are. Set them to slow when you want to relax or speed them up for a more upbeat ambience. But there is no way to change the color theme. You can change the intensity of the purifier or completely turn it off separately from the flame effects. The heat also operates independently from the flame effects. 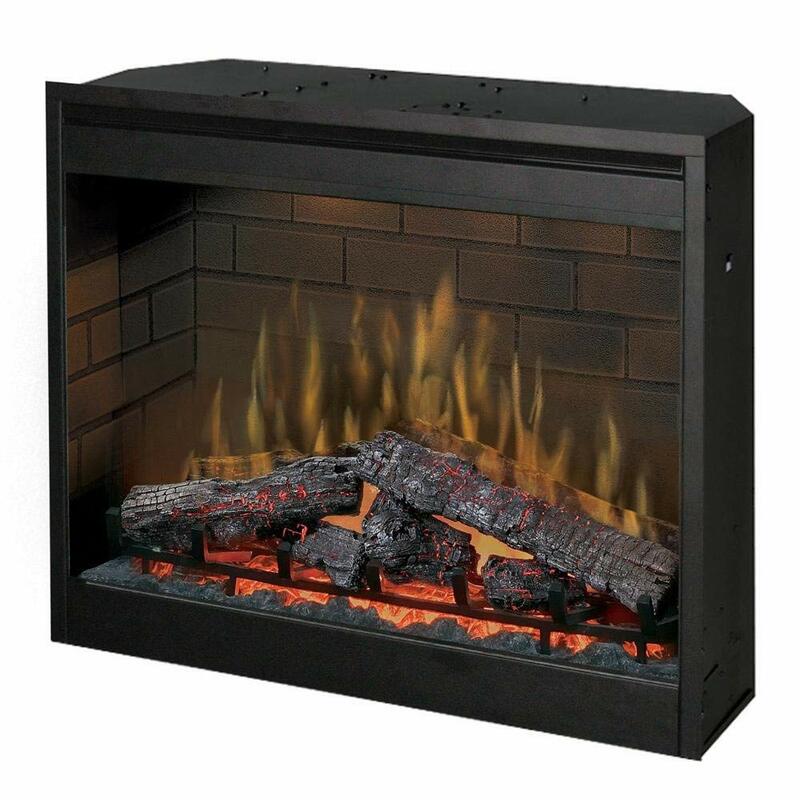 This makes the Dimplex Purifire insert perfect for year-round use. You can turn on whichever function you need on its own. The default heat setting is 72oF, but you can increase or lower it depending on your comfort needs. When the thermostat reaches the target temperature, the heater will periodically go on and off to maintain it. The heater can warm a room of up to 400 square feet. Finally, there is a sleep timer which automatically turns off the fireplace after a set amount of time. You can set the timer anywhere between half an hour to 8 hours. 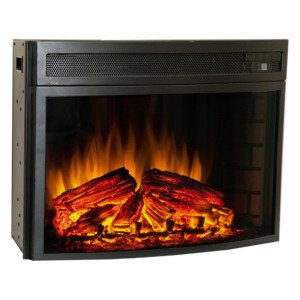 If you are looking for a cheaper fireplace insert that you can recess or mount onto the wall, this is the best choice. It costs less than $500 but has plenty of features including heat. Let’s start with the aesthetics. The insert is 50 inches long and around 21 inches high. The exterior trimming is black. It looks great in any room and goes well with all kinds of décors. But it is especially ideal for contemporary homes. The logs and flames use LED lighting to create a super realistic glowing and flaming effect. Using the included remote control or the buttons on the insert’s control panel, you can choose from various intensity options ranging from a soft relaxing glow to an intense blaze. The integrated heater can warm up a room of up to 450 square feet. You can easily adjust the temperature to your preference or completely turn off the heat without having to turn off the flame effects. A sleep timer allows you to set the fireplace to automatically switch off after a specific amount of time (30 minutes to 7.5 hours). This saves energy if you fall asleep on the couch or if you use the insert in your bedroom. It’s fairly easy to install the unit yourself. You don’t have to hire a pro. The manual has simple instructions that will show you how to recess the fireplace into the wall. Obviously, the main thing you need to consider is how realistic the fireplace is. So you need to look at several aspects including log set, flame effects, sound and overall design. There are also several other general factors you should consider regardless of which type of electric fireplace insert you buying. They include things like settings, versatility, and size. Electric fireplace manufacturers go to great lengths to simulate a real wood-burning fireplace. They use different types of techniques including LED lighting, ultrasonic technology, and even ethanol to replicate that cozy feel of a real fireplace. Before you buy a fireplace insert check how well they have succeeded at making it look real. Look closely at the pictures and videos if they are available. Also, read what customers are saying. Does the fireplace look real enough? Do their guests often confuse it for a real wood-burning fireplace? Generally, most electric fireplaces do a good job of creating realistic burning effects. The logs look like they are glowing and flames dance about like in a real fire. But some fireplaces will be a bit more realistic than others. For example, the Dimplex Opti-Myst Pro which uses ultrasonic technology produces more realistic flames than the other inserts which use LED lighting. But it’s more expensive as well. If you want a hyper-realistic fireplace, look for one that doesn’t just replicate the burning logs and dancing flames but also the signature crackling sound of burning wood. Not many electric fireplaces have it. In our reviews above, only the Dimplex Opti-V Solo has those sound effects. Luckily, you can buy a fire crackler sound system separately and install it near your electric fireplace. Two popular ones include the Adagio Fire Crackler Sound System and the Comfort Smart Fire Crackler Sound System. They both use AAA batteries and come with volume controls. So if the best electric fire insert you have found doesn’t have any sound effects, you can add them separately using one of these crackler sound systems. They both cost about $30. Even traditional fireplaces are not installed just for heating. They are an essential part of a room’s décor and ambience. They feel cozy and relaxing. Make sure that the electric fireplace you are going to buy has this same effect. Most electric fireplace inserts use a black trim around a widescreen. This allows it to blend in perfectly in both traditional and modern style homes. To create a cozier look, some add a brick-like lining on the inside which becomes visible when the fireplace is switched on. When it comes to function, there are generally two types of fireplaces. There are those whose function is simply to make your living room or bedroom look great. They focus a lot on design and aesthetics. The flames, logs, and embers look very realistic. Then there are those that also function as a room heater. They have an integrated heater and a fan that spreads warm air throughout the room. This creates the impression that it’s the ‘fire’ that is making the room warm. The heaters vary in output with some capable of heating spaces as large as 1,000 square feet. But most can only warm midsize rooms of around 400 square feet. With most of these fireplaces, you can control the heater separately from the flame effects, ensuring you enjoy the fireplace all year round. In addition to these two types, there are also electric fireplaces that have an integrated purifier. But there aren’t many of them. Dimple Purifire electric fireplaces are the only ones I know that have this feature. They are great if you have allergies or a respiratory problem like asthma. The purifier removes pollen, dust, pet dander and other allergens and pollutants from the air. However, if you or someone in the house has a serious respiratory problem or allergy, I’d recommend you also get a dedicated HEPA air purifier. Another thing to check before buying a fireplace is the type of settings it has. Here are the ones that matter most. Timer – this setting is important if your fireplace has a heater. It saves energy in case you fall asleep or forget to turn off the fireplace. It also comes in handy if you have installed the fireplace in your bedroom. You can leave it on and set it to switch off after a few hours. Flame effects – check whether you can change the intensity, brightness or color of the flames. Some fireplaces will let you change the intensity but not color while in others you can only change the intensity. Heater settings– if the fireplace comes with an integrated heater, check which temperature settings are available. You should be able to reduce or increase temperature and turn the heater off/on separately from the flame effects. This is one of the most important factors to consider when buying an electric fireplace. You need to make sure that the fireplace will fit in whichever space you have available. Most electric fireplaces are designed to be fitted into existing fireplaces. Measure your fireplace first and then find an electric insert that is closest in size. You may need to make some trim adjustments to get the insert to fit well and look great in the fireplace. If you don’t have an existing fireplace, there are smaller electric fireplaces that can be installed in a cabinet or recessed into a wall. Can I plug in an electric fireplace in a standard outlet? Many electric fireplaces can be plugged into a standard outlet. However, unless you want a wire snaking out of the fireplace, you might want to ask an electrician to add an outlet inside the fireplace. Some electric fireplaces, especially those with powerful heaters, should only be directly wired into your home circuit. You’ll need a qualified electrician to do the installation. Always check manufacturer specifications about powering the fireplace insert. Can I turn off the heat in a heater-integrated electric fireplace without turning off the flames? Yes. Most heater-integrated electric fireplaces allow you to control the heater separately from the ‘fire.’ So during warm weather, you can turn off the heat and still enjoy the ambience of the fireplace. Can I use an electric fireplace to heat my entire home? No. They are meant for warming up single rooms ranging between 400 and 1,000 square feet depending on heater output. But if you have an open plan living area, a powerful heater can warm adjacent spaces like the kitchen and dining area. They are very safe. In fact, they are safer than gas or wood fireplaces because they don’t burn any fuel; hence they don’t produce smoke or pollutants. Since the ‘fire’ doesn’t actually produce any heat, they are cool to the touch. So you don’t have to worry about your kids or pets touching the glass screen or the logs. Do electric fireplaces need venting? In fact, when you are installing an electric fireplace in an existing fireplace, you should close off your chimney. It’s no longer necessary and can even cause energy wastage if you have a heater-integrated insert. 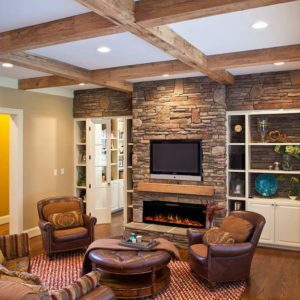 Are electric fireplaces hard or expensive to maintain? No, not at all. You usually only need to replace the bulbs once they burn out. But since most uses LED bulbs, they last a very long time before they need to be replaced. If you get a fireplace with a purifier, you’ll need to change the filter regularly based on the manufacturer’s recommendations.